Don Samuel (D.S.) Goonesekera, former Minister of Labour and Member of Parliament for Udugama and Habaraduwa was one of the founder members of the Sri Lanka Freedom Party (SLFP) which was established by S.W.R.D. Bandaranaike in 1951. He was the person who was entrusted with the task of handing over to Prime Minister D. S. Senanayake the proposals agreed upon during the Sinhala Mahasabha Meeting in Madampe in 1951. When the Working Committee of the United National Party rejected the Madampe proposals, S.W.R.D. Bandaranaike, the chairman of the Sinhala Mahasabha, decided to leave the UNP. Several parliamentarians, including D.A. Rajapaksa, Herbert Sri Nissanka and D. S. Goonesekera, followed S.W.R.D. Bandaranaike when he crossed the floor of the House to the Opposition benches on July 12, 1951. D.S. Goonasekare was considered a politician of highest integrity and he passed away on August 7, 1983 at the age of 87. To learn more about the life and times of a politician of a bygone era, Reminiscences met with Dr. Tilak Goonesekera, his eldest son (Dr. Tilak is an Eye Surgeon and he was the President of the GMOA in 1977). D.S. 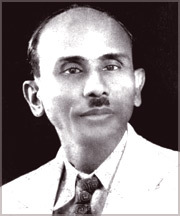 Goonesekera was born on November 13, 1896 in Habaraduwa. His primary education was at Dharmika School in Katukurunda, Habaraduwa, and for his post-primary education, he joined Mahinda College, Galle, when the famous theosophist F. L. Woodward was the Principal. He started his career as a Licensed Surveyor, and while visiting the remote villages, his interest turned towards the poor villagers. He was a very generous person and when poor people sought his assistance, he surveyed their lands without a fee and appeared for partition cases. He first got into politics by becoming the chairman of the Kodagoda Village Council in 1927, and he held this post uncontested for a long period. In 1939, he contested the Main Street Ward of the Galle Municipal Council and became a Municipal Counsellor, and later he was elected as the mayor of Galle in 1944. In 1947, he became a member of Sri Lanka’s first Parliament representing Udugama electorate which stretched from Benthara-Elpitiya to Hiniduma. D.S.G. lost the Udugama seat at the 1952 election due to the change of party from the UNP to the SLFP. In fact, out of the eight parliamentarians who contested under the SLFP, only S.W.R.D. Bandaranaike from Attanagalla and D.A. Rajapaksa from Beliatta were able to retain their seats. However, all of them returned to Parliament at the 1956 general election. In 1956, he was elected to Parliament as the Member of Parliament for Habaraduwa. He served as Parliamentary Secretary (Deputy Minister) for Trade and Commerce during Mr. Bandaranaike’s period. During Mrs. Bandaranaike’s regime, he was appointed the Minister of Labour, Cultural Affairs and Social Services. D.S.G. hailed from an affluent family and was the only son of Don Marthelis Goonesekera and Dona Clare Abeygoonewardena of Galle. He had two sisters in his family. He inherited a considerable amount of property as his father was a very wealthy landowner. He got married in 1927 to Nandawathie Victoria Wickremasinghe from Borelle Walauwa in Kirinda, Puhulwella. Her family too had rubber and coconut estates. Thanks to his family wealth, D.S.G. did not have to worry about money. He was a politician with a lot of humane qualities. He was very concerned about the education of the villagers. He donated land and with his own money, he built five schools, one such was the Badepita Junior School. At the beginning the teachers were paid by him until the schools were handed over to the government. His car was always available to bring poor patients from remote areas in his electorate to the hospital, and he took upon himself to inquire about their health conditions. Many government offices were located in the Galle Fort. Since his house was also in the Galle Fort, villagers who had to visit these places would invariably come to his home for a cup of tea or a meal or for lodging. His house practically became an 'open restaurant.' When he became the Minister of Social Services, he started Milk Feeding Centres in all local government areas so that the malnourished mothers and babies would get free milk daily. Philanthropy was a quality and a trait that he inherited from his own parents. Dharmika School in Katukurunda which D.S.G. attended for his primary education, was a school founded by his father with the support of a few others in the area. His mother was a very generous social worker and she even helped villagers to establish their own cottage industries like lace making. D.S.G. was a teetotaler and became a member of the Temperance Movement. Being a vegetarian himself, he supported the 'Eat No Beef' campaign in the 1930s inspired by Anagarika Dharmapala. He was also a devout Buddhist and served as the president of the YMBA, Galle, for 30 long years. One day D.S.G. was travelling first class by train from Galle to Colombo. When a ticket collector got into the compartment and checked his tickets, he could not find his rail pass with him. So he was asked to pay a fine which he did without a fuss. What had really happened was that his son was travelling in the third class with his bag where he had kept his rail pass but he had completely forgotten about it. The interesting thing is that even a minister had to pay a fine at that time if he committed an offence. None of D.S. Goonesekera’s children wanted to do politics but they became successful professionals in other fields (five doctors, three teachers, an engineer and a lawyer). However, they still consider their father a role model for them, particularly his personal characteristics such as honesty and personal integrity. He was indeed a politician and a gentleman.